With so many new followers and friends online, sometimes it seems difficult to keep up, stay connected, respond. The NoCZ 2012 Challenge continues, the Kreative Blogger Award wants attention, work calls, the next round art art classes, beginning January 25th, required final planning, and my studio work continues. Ahh, at one time it seemed like overwhelm… and then a blessing appears – a snow day. Missing in Action? In Action! Have I been missing in action? Not this time, simply in action in my studio and at the Library. Life is shifting, moving changing… quickly. New artwork in stone, requests for more, people placing holds on pieces yet unfinished! Ideas generating and being manifested as quickly as pieces can dry, more quickly, sometimes. Yes, I write. Yes, I make up stories. Yes, I am a photographer, artist, writer. Yes, I make art. Yes, I teach. Yes, I learn. Yes, some say I am not focused. Yet, I feel very focused. I have 20 new stone pieces nearly completed… they will be finished this week! They will be photographed and sold. The photographs will morph into greeting cards, magnets, posters. Some will have writing added. Yes, I can and do multi-task. Saying YES! It may seem as though I am on a heart-kick in my stone pieces, these are simply experiments for larger pieces – stepping stones, baby steps. While I multi task, I find that I must work with my hands, to shape, build, give form to objects. Working with recycled materials to make molds, casting multiples to satisfy a growing group of collectors. No two hearts or circles are alike, each contains a different combination of unique stones, a variety of colors, shapes, sizes. Not unlike people… and some are created while thinking of people I love. Are they Valentines? For some they are. For me, every day is a Heart Day, a Love Day… and each day goes full circle. My heart and my time, my love of nature, the beach and the beauty of ancient energy, captured in simple shapes and simple stones. They are for sale – the stone pieces. Prices start at $25.00 USD and go up from there… As I finish each one, I will share them individually and note if they are sold, for sale, with sizes and prices… for now a shot of my wonder filled work table in my studio at home. I have stones, thousands of stones, sorted by color, type, and size – in muffin tins, boxes, plastic drawers. What a gift, living so near the endless source of abundance… I am so blessed… and possibility is endlessly opening new doors. There are days with bright sunshine. They are lovely, warm, and comfortable. Then there are the days of Lake Superior’s Superior Storms. Saturday (10/15/2011) was one of those days with multiple warnings: shoreline erosion, high wind, and hazardous weather – a perfect day for the beach! The Beach Studio was not a safe bet, with trees falling right and left. Not wanting to be trapped in the woods on a two-track, alone with no chain saw to cut my way out, I ventured to a “safe” beach on a safe road, and WOW! I’m so glad I did. In a period of 2 hours, I was able to shoot a Super Superior Storm including sunshine, monster waves, and was even blessed with a rainbow! West winds howling at 60mph, I leaned with my back to the wind, booted feet planted firmly, listening for the sound of cracking trees while finding the sound of the rhythm of the waves in order to move out of the way quickly. Yes! I love these storms and am not afraid to embrace them. The energy is incredible and I become incredulously one with the storm. At the same time, protecting lenses and camera from the blowing sand and spray, unable to even shoot into the wind… Yes! Exhilarating! Yes, rewarding! Yes! Risky? Maybe, and yet caution to the wind while knowing the boundaries, standing on the edge, aware of the logs and trees being tossed about like toothpicks, retreat plan in place. Yes! Changing light settings every other minute as the sun and clouds played tag with light and dark, becoming a human tripod in the wind, capturing sand blowing, a lone brave or foolish seagull struggling in flight, the spray on the waves, reflections on wet sand, dramatic skies. 250+ images. Fast. Did they all come out? Of course not. Some are incredible. Some are dramatic. Some are beautiful. Some are incredibly, beautifully dramatic. Just like Lake Superior when Mother Nature offers fury on the wind. These are dark images from a dark day. To brighten them would totally change the mood, the feeling, the heaviness of the clouds. A storm that washed the beach clean of stones, covered them with sand… a storm full of magnificent energy. May you always be able to dance in the wind and rain of your storms ’til the rainbow appears! I make art. I write. I teach. Most of all, I learn. I am surrounded by beauty and beautiful people. OMG I am blessed! I notice small things. I make big things out of small things. “My” students are learning and excited about what they are learning. They are producing beautiful drawings and paintings. They are bringing them to class and sharing. They are motivated and doing more outside of class. They come into class and share AHA! moments that happened for them during the week. They are having fun with art and sharing with their kids and grandkids! They are seeing trees, colors, faces, shapes, light, contrast, textures, balance, the moon and the world in new ways! Adults, they came into class thinking they “couldn’t” draw. They wanted to learn to draw. Oh! Did I already say how excited they are?… excited about learning and I am excited about how much they are learning and seeing. I teach from a fundamental principle of 90% of learning to draw, or paint, or make art is learning to see… then learning how materials work in the physical world, how our optical nerves register information and eye-hand motor skills. We practice. Then we practice some more – like riding a bicycle, practicing until AHA, we find our balance! Teaching inspires me… opens my brain to new ideas and ways of looking at the world, people, my own work, what I know, what I have learned from GREAT teachers and friends and students. I first learned to see by looking, to draw by drawing, by daily practice… and now I make environmental art, noticing the small, putting many small things together, noticing shapes and colors and patterns in my messy studios. My students have inspired me once again… Less computer time and more studio time, working with my hands and physical materials. As I tell these students, I once learned to draw like Michaelangelo, and he already did that and is dead! Revered, admired, copied ~ he did what he did so beautifully. The ability to draw is in each of us if we can write our name or make marks on paper or walls. So, now I paint and draw with stone from a natural palette calling attention to small things. I paint with light, photographing nature and stones. For me, making art is an amazing balance between light and dark, heavy and weightless, lifted by laughter & joy and built on a solid foundation of ancient wisdom, observation, and yes, feeling. It is a dance requiring access to both sides of the brain simultaneously. Even that requires practice.. daily doses of right and left brained activity. The color filled display of fall has fallen, leaves are on the ground, returning to nurture the earth through winter ‘til spring. The seasons flow and I will go to ground, as well, in a sense. Working with my hands and eyes and in my studios. I LOVE creating OMG responses, in myself and others. Here is a tiny peek at my winter series in stone – many, many works in progress… this is part of one. For me, this has created a wonderful dilemma: viewing and editing 150 images a day and what to share online, what to keep for the books I am working on? On Sunday, I went to Lake Superior, a favorite beach, at dawn. This is my personal church service, to thank Creator for all of the incredible gifts this year. I am grateful for the gift of light, of eyes to see, for the spectacular colors and changes of seasons and life. I am also grateful for the gifts of my way of seeing and for the cameras which allow me to capture and share. I am grateful to Steve Jobs and Bill Gates for their willingness to dare and create what allows me and us to share this beauty. I am grateful for their willingness to try include everyone in their sharing. Because of their daring, we are capable of sharing globally. We can choose to share problems and we can share beauty. We can ask questions and perhaps find answers to global issues. As people Occupy Wall Street, I occupy the woods, the beach, in awe, gratitude and wonder. I went to the beach in gratitude and returned home with one splendid agate, 150 photographs of nature’s splendor, and unlimited reverence for nature and the rhythms of life. Food for the soul, may you enjoy the feast of these simple images. Fall. I fell for fall long ago. The beauty of fall is partly why I stay in Michigan, along with winter, summer, and spring. The changing seasons seem to match my personal rhythms, the flow of nature. While shooting these, and totally enjoying the day and the sun light, I thought there was a stick causing the ripples on the mirrored surface of the water. Upon closer inspection, it appeared to be a sleek furry critter, swimming upstream. Hoping it was a beaver, I watched it swim closer, then dive, disappearing quickly under the river bank. Probably a muskrat, although beaver and otter also live here. Michigan often gets a bad rap as it is known primarily for the Motor City, Detroit, with the negatives. I grew up in Detroit, trained as an artist in Detroit, grew up on a tree lined street where once upon a time we raked leaves into big piles, then hid, jumped and played in them. After dark the neighborhood parents supervised bonfires of leaves. Sometimes we even roasted marshmallows over burning leaves. I can still remember the wonderful smells of those evenings. Do kids still do that? It was part of the rhythm of life, even in the city, a fall ritual as mornings grew colder and days grew shorter. Just for giggles, how about a little different rhythm? You can alwys listen to “Muskrat Love” (c. 1976) or “Muskrat Ramble” (c. 1926) by Louis Armstrong. May your day be warm and filled with colorful rhythms of Nature! a few more views from roads travelled. The fall color just keeps becoming more brilliant? Raucous? Audacious? Spectacular? Gorgeous? Beautiful? Splendiforous? A friend of mine once coined the word “Brazilliant” to name one my images he owns. It was such a fun and discriptive word, I use it for the title. What do you call the amazing arrays and displays of color in the fall? Nature’s palette is so palatable and yet so brief in its display. I am so lucky to witness this each year and it’s never the same and always thrilling. Enjoy! I know the photo challenge this week has changed to “sunsets”, and I’m choosing to stay with Fall for now, so more fall is forthcoming to be celebrated while it lasts! I think it’s called “Making hay while the sun shines.” The sunsets will be fabulous this week as well – no rain predicted for 10 days, so also no storms to take the leaves away. Fall ~ So fall this Fall so far is mostly RED! Oh! Poor me. Life is so hard! LOL! ablaze against green against skies of gray and blue. The road glows without sunshine and where is yellow? Hiding, peaking, sneaking, teasing between other brilliant views. “Look at us” they call, demand. within and through these walls of color. in awe and gratitude and joy. Taking a month long hiatus, cutting down on computer time in order to be with people in my life. My old computer is being renewed soon, updated to provide faster, better access, more memory. This is thanks to my wonderful offspring. House guests started descending in mid-August, a very special gift out here in the boonies… and while torn about blogging vs. not, I intend to enjoy each and every visitor to the max. NTC - on a ridge overlooking Lake Superior ~ Ahh! Fresh Air, Quietude, Blueberry Snacks, Wildlife - Char on vacation! 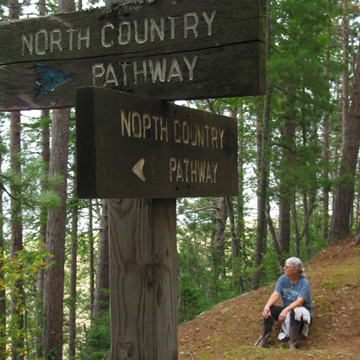 Last week, it was my friend Charlotte visiting, and I was delighted to be able to share a day hike on the North Country Trail with her. This week, my favorite (and only) son is here. At the same time, I have to work at my day job, produce artwork for an upcoming sale and prep for fall classes. A single blog post can take 3-4 hours with my limited access and slow computer (and sometimes perfectionism), so from now until September 21st I shall continue be more hit and miss than usual. Still taking lots of images, and thinking of my devoted readers. 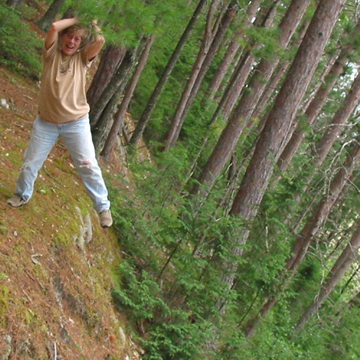 Playing on the trail, taking time to smell the pines, taking leaps of Faith and growing… time to live more offline, for now. It is simply a matter of time… and loving the company I keep. Finding balance, yet again. I turned 66 on August 17th, and realized that with only 33 more years to live, it is a matter of time! 🙂 Time Matters! 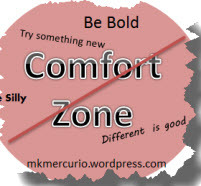 Living on the Edge and Taking Leaps of Faith - Yes! May your days be filled with leaps of faith, miracles, and love for life in the other real world of the senses. Thank you for your patience and kindnesses, always!